What is the absolute best way to be qualified for a better job than you currently have and ensure employers will want you over other candidates for a job? The simple answer to this is actually two things; education and experience. If you have certifications and an advanced degree, it has been proven time and time again you will have a better chance at a better job, but what if you don’t? The reality is working any job while going to school of any kind is going to take commitment, dedication, and discipline from you in order to achieve your goals. In order to get the job you want, the work will be long and arduous, but very rewarding in the end. If you keep your vision in front of you and make small strides toward you goal, no doubt you can achieve that goal, but where do you start? A great way to earn a degree or certification while still working is to take full advantage of online classes offered at many different schools throughout the country. With the greater popularity of online degrees, there are many distinct advantages to earning a degree online. Some of these include, flexibility regarding scheduling time for the class, usually lower cost of tuition, and the ability to take the class from home. 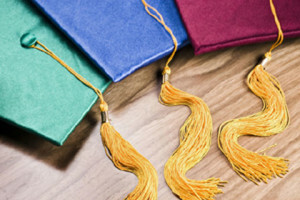 In addition to these advantages, advances are being made in the online degree community regularly, which means there is a much wider variety of degrees available than ever before. Take a look at 10 Advantages to Taking Online to see some other advantages to getting your degree online. In the end, your goal is to ensure you are improving employability skills with advanced education and training. Taking advantage of online classes allows you the flexibility to work when scheduled so you don’t lose your income as well as the ability to complete your schoolwork as needed. Most of the time online school schedules are set so assignments are not due on a particular day, but instead by the end of a week, allowing you to work on the assignments on your off days from work. If you still aren’t convinced you should pursue an online degree or certification, review the account in the article Using Broadband to Further a Career: Earning a Degree from Home, which shows the author was unable to negotiate a higher salary simply because he lacked a particular degree the hospital he applied at wanted him to have. After reading both articles, and seeing how important a degree or certification can be to help you get a better job and improve your negotiating position with potential or current employers, what if you don’t actually have a job right now? School is going to cost money and you will need some coming in so if you don’t have a job how do you solve this problem? One great way to have some money coming in would be to work a job and if you don’t really want to go out and “pound the pavement” you could apply for work online. Actually, both could be done which of course would increase your chances of actually landing a job. As I stated above, taking online classes takes a lot of discipline, which working at any job takes as well. If you have had your job for a while, or have received praise from your boss for your dedication and reliability, taking online classes will be no problem for you at all. In fact, if you have taken regular classes, having an online course schedule might be a bit refreshing for you. Instead of having to deal with the crowd on campus, or sitting through long lectures at specific times you are solely in charge of your own success online. Another great advantage to online classes is the lack of distractions. The only distractions will be the ones you allow yourself to have. With all the tools at your disposal, a goal of getting a better job or at least a better paying job taking online classes is the key to improving employability skills for you. Check out some different courses, compare different schools and find the one that’s right for you so you can be on your way to earning more money than ever before.